This case study is about the biological treatment of industrial wastewater specifically a petrochemical facility. Custom HC, by Custom Biologicals, is the biological product used in this case study. Custom HC, a bioremediation bacteria product, is specifically designed to metabolize petrochemicals, hydrocarbons, phenols, and fuel oils. The problems in this case study are typical of industrial wastewater problems; surcharges and odors. Physical Plant: Four 500,000 gallon clarifiers, a two stage 40,000 gallon flocculation/aeration collection tank and a 2,000,000 gallon lagoon. Problem: County surcharges for excess COD and TSS amount to an average of $450,000.00 per year. VOC’s are offensive to adjacent neighbor. Previous Treatment: Use of polymers injected at the headworks. Initial Shock of three 55 gallons Custom HC. 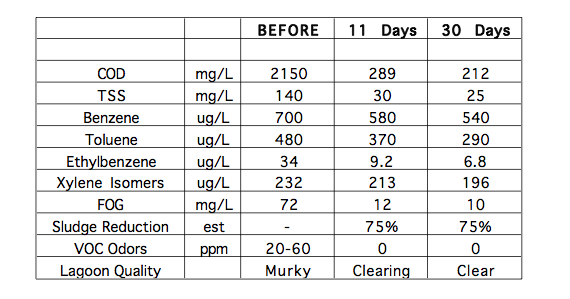 Note the very large reductions in COD, sludge, and odors. This case study outlined the use of Custom HC to biologically treat the industrial wastewater of a petrochemical facility. Custom HC is available as a liquid concentrate, a ready to use, and Custom HC Tabs, a slow release tablet. Custom Biologicals has over twenty years experience with the biological treatment of industrial wastewater. Every facility and every industrial effluent is unique. Contact Custom Biologicals to talk about your industrial wastewater problems. Custom Biologicals manufactures a wide variety of biological products for use in the environmental industry. Distributor inquires, both domestic and industrial, are welcome.